Munich - There may have been plenty of familiar faces on the scoresheet in the Bundesliga this weekend, but it was one of the top flight’s lesser-known talents who bundesliga.com's users voted best player of Matchday 6. Bayer 04 Leverkusen’s was the clear winner in the ballot, his brace against 1. FSV Mainz 05 on his starting XI debut for die Werkself earning him a staggering 39 per cent of the vote. The 24-year-old Australia attacker hadn’t featured much in Sami Hyypiä’s side so far since swapping Fortuna Düsseldorf for UEFA Champions League participants Leverkusen, but he opened his account with the first goal at the Coface Arena on Saturday, before even adding a second before half-time. 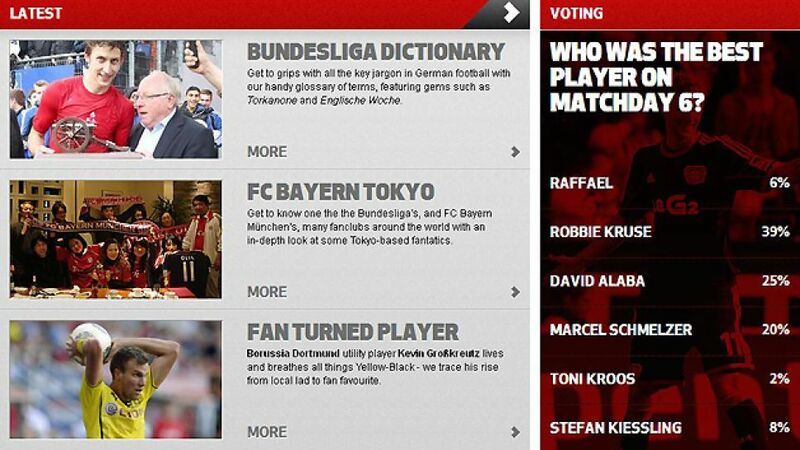 FC Bayern München’s David Alaba (25 per cent) was second in the vote. Alaba’s two assists in Bayern’s 4-0 win over FC Schalke 04 on Saturday evening capped off another fine display by the Austrian left-back. Franck Ribery, who tapped in Alaba's fine cut-back to make it four for the visitors 15 from time, was full of praise for his 21-year-old team-mate following the victory in Gelsenkirchen. “The lad's really special,” said the Frenchman. “He’s playing well and provided another two very good assists today. I’m really happy for David." Third in the poll was Borussia Dortmund left-back Marcel Schmelzer (20 per cent). The 25-year-old’s sweetly-struck free-kick put the Yellow-Blacks ahead against 1. FC Nürnberg on Saturday, but Jürgen Klopp’s side were denied a sixth straight Bundesliga victory by Per Nilsson’s second-half equaliser. Kruse’s Bayer team-mate and last season's top scorer Kießling, whose header against Mainz was his fifth goal of the current Bundesliga campaign, received eight per cent of the vote and came fourth. Raffael’s brace for Borussia Mönchengladbach against Eintracht Braunschweig earned him six per cent of the vote, while Bayern midfielder Toni Kroos received two per cent for his display against the Royal Blues.